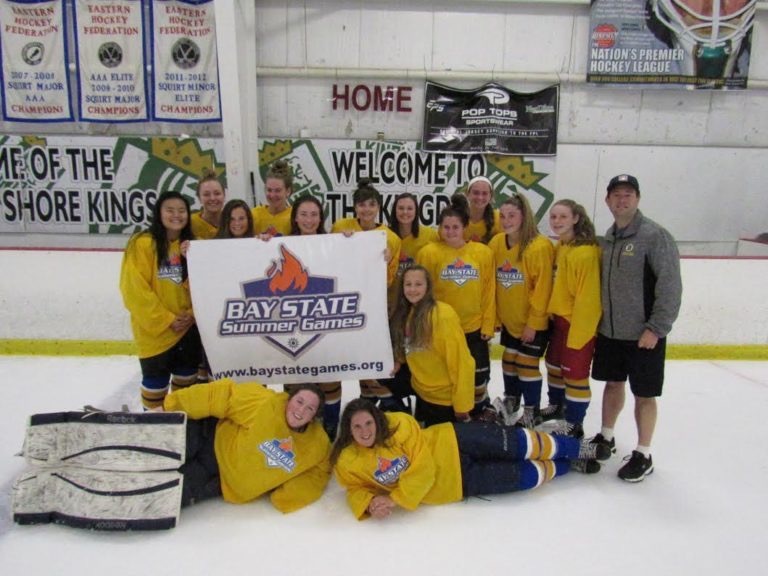 On July 9th, seven Medford residents captured the bronze medal at the Bay State Games for the Metro girl’s hockey team including Medford High’s Erin Allen, Patricia MacLean, Mamie Powers, Julia Shanahan, Caitlin Sheehey, Abby Vigliotte, and Matigon High’s Alyssa Morgan. The South/ Coastal jumped out to a 1-0 lead the first shift of the game and held that lead until the final second of the game. In the final seconds of the game the Metro added a 6th skater in Mamie Powers. As the clock was about to expired Powers knocked in a rebound just beating the buzzer to send the game to overtime. After 10 minutes of five on five overtime play the game remained tied. Double overtime was played four on four until a tripping penalty put Metro on the power play. With a four on three advantage Arlington Catholic’s Nicole Amato scored on a wrist shot top comer to win the game and the bronze medal. Earlier in the tournament the Metro skated past South/ Coastal 8-5 with a goal from Vigliotte. Game two of the tournament had the Metro and the Northeast tie 1-1 thanks for Powers scoring the game tying goal. Matignon’s Morgan scored the lone goal when the Metro lost 4-1 to the West/ Central team.